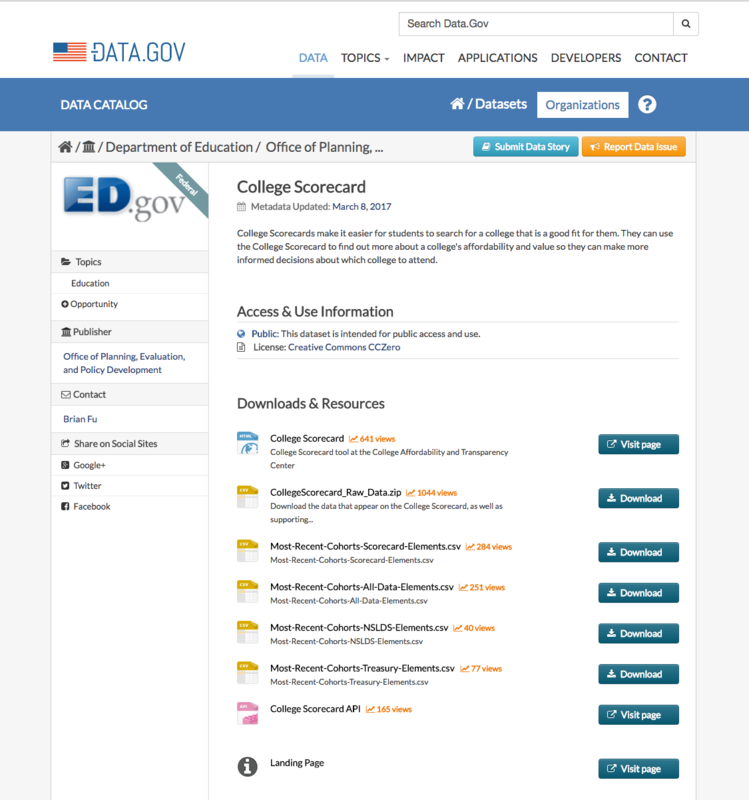 How can I download the raw data for the College Scorecard application? Specifically I am interested in cost of attendance information. When I visited the link to download a zip file from this page, I received a 404 error. I reported the error on Data.gov, but I am hoping others know of a way to get that information. I work for a scholarship/college access organization and college cost of attendance is necessary in determining how much to award a student. It would be impracticable and a waste of resource to manually gather this information for every single college when it appears to be open source and available through College Scorecard. Try going to the canonical source of the data; data.gov is a metadata portal first and foremost. Inevitably, there will be somethings lost in translation, most likely because of linkrot. data.gov's catalog points to datasets created by 3rd party canonical authors/sources; these 3rd parties (in this context, almost entirely U.S. federal government agencies) can be found/tracked by viewing the breadcrumbs and/or the logo in the content document of the dataset. The correct answer to 'How to download College Scorecard raw data' in this context then, is to download it from the source. The difference between the two is data.gov points to the .app subdomain, while College Scorecard points to the .apps subdomain. College Scorecard Data (Canonical Source) is where I found the raw data link, and there's other information there regarding the dataset as well. Brittany, I've just downloaded the data from here and it worked. How is average cost in college scorecard derived?